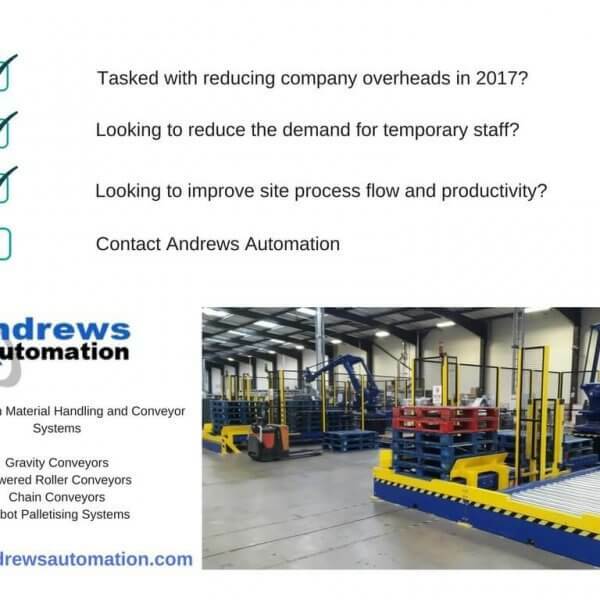 Andrews Automation Ltd were recently tasked with providing an automated conveyor solution for a client with a view to streamlining their packing process and making it more efficient. There was a requirement to create a pallet handling system to handle quarter pallets and transport POS assemblies down a packing line whilst operators carry out the packing process. 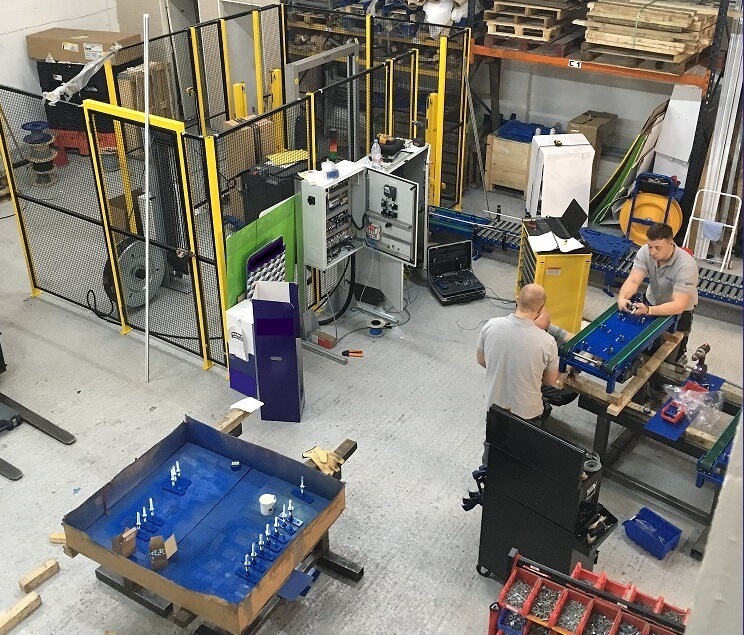 At the end of the line, once the packing of the POS stand has been completed, a cardboard sleeve is manually guided over enclose the packed stand ready for shipping. At this point the client was looking for an automated solution to single or double strap the cardboard sleeve onto the quarter pallet in preparation for palletising. 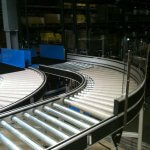 Discussions were had as to whether to invest in a powered roller conveyor with stop / start stations, or non-powered roller conveyor that would need a little manual intervention. Talks were also held as to whether an automated palletising system would be beneficial to palletise the completed stands. 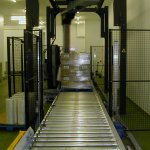 There was also mention of an automatic pallet wrapping station to really take out as much manual involvement as possible. It was decided that in order to meet initial budget projections, there needed to be an element of operator interaction with the system. Besides, any of the aforementioned added value solutions can be retro fitted to system at a later date if required. Work began to create a pallet handling solution that could deal with a wide range of variants on the quarter pallet design. A conveyor system needed to be developed that could cope with both a flat bottomed surface, and a quarter pallet with feet in each corner. The client also needed a conveyor system that was, rather obviously, able to process each stand in a prompt and efficient manner. Significantly quicker than the previous, 100% manual operation. A Siat was then selected as the integrated strapping solution and our designers set to work. The final system was able to process up to 200 stands per hour, vastly improving client throughput, and Return on Investment for this project is forecast to only be a matter of months. Hard at work on our latest Contract Packing solution. All of which was designed, mechanically and electrically built and tested in-house at our facility in Goole.